Nicholas James Vujicic (born 4 December 1982) is an Australian preacher and motivational speaker born with tetra-amelia syndrome, a rare disorder characterized by the absence of all four limbs. As a child, he struggled mentally and emotionally, as well as physically, but eventually came to terms with his disability and, at the age of seventeen, started his own non-profit organization, Life Without Limbs. Vujicic presents motivational speeches worldwide, on life with a disability, hope, and finding meaning in life. He also speaks about his belief that God can use any willing heart to do His work and that God is big enough to overcome any and all disabilities. 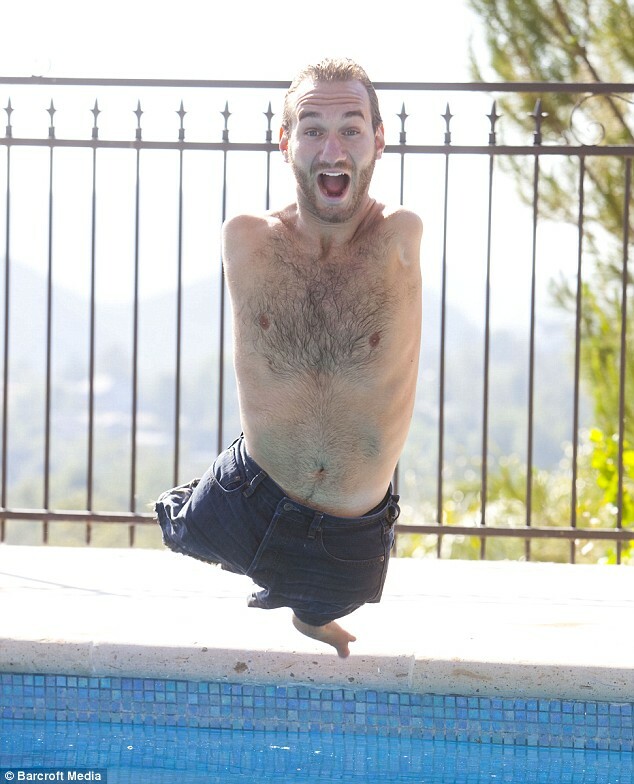 [Nick Vujicic] I have no arms and no legs but I’ve very thankful that I have my little drumstick here. People freak out when they see me for the first time. It was so cool, I was at a water slide all by myself, everyone at the bottom of the slide obviously are looking up waiting for the other people to come down – here I come! They’re freaking out! They’re like (AWE) They’re like this. And I was tempted to look at myself: “What happened?” You know. [Nick Vujicic] And there were time when I looked at my life thinking I can’t do this and I can’t do that and you keep concentrating on the things you had or the things you wish you didn’t have. And you sort of forget what you do have. And there’s no point, I believe in my life: Where, I wish I had arms, legs – I wish I had arms, legs, I wish I had arms legs. I wish (inaudible). But, what I’ve seen in life are just a couple of key principles and what I’ve seen is to be thankful. It’s hard to be thankful man, I’ll tell you when I was eight years old I sort of some-ed up my life: I’m never gonna get married; I’m not gonna have a job; I’m not gonna have a life of purpose. What kind of husband am I gonna be. I can’t eve hold my wife’s hand. It’s a lie to think you’re not good enough! It’s a lie to think you’re not worth anything! [Nick Vujicic] I love life. You know so many people say: “How come you smile so much?” And I’m like: “Well, it’s it’s it’s a long story”. (laughs). But it’s very simple at the same time. You see it’s very hard to smile sometimes in life, there are things that happen that you don’t know how long the storm is gonna be. And today, I wanna share with you some principles that I’ve learned in my life that you can use in yours. [Nick Vujicic] Being patient is beautiful, I tell you its the hardest thing. But I realize I may not have hands to hold my wife’s hand but when the time comes I’ll be able to hold her heart. I don’t need hands to hold her heart. [Nick Vujicic] You know, it is scary to know how many girl have eating disorders. It is scary to know how many people are just angry at life because of their situation at home, and angry at others. It’s scary to know how many people actually feel like they are worth nothing. Every single girl right here, right now, I want you to know that you are beautiful. You are gorgeous just the way you are. And you the boys: “You The Man”. [Nick Vujicic] On this DVD, I share my experiences in life how I overcome challenges and seen a new fresh perspective in life; to be thankful, to dream big and to never give up. I speak to children, youth and adults about key issues and principles that I apply in my life that has given me the strength to conquer all that comes before me.